The fleeting nature of sand castles is such that they've become a metaphor for all things ephemeral. As Jimi Hendrix pointed out in song, "Castles made of sand, fall into the sea, eventually." If the tide doesn't get them, they fall down anyway when they dry out. Why? Well, it's basic physics, or perhaps not so basic. And how does sand defy gravity and stand up anyway? Those are questions kids don't usually ask when they fill a pail or a discarded plastic beer cup with damp sand and flip it over to create the beginnings of a castle. Physics and the science of sand castles will come into play to some degree when the Friends of the Dunes host their annual Sand Sculpture Festival on Saturday, not that most will think about it. Google "sand castle physics" and you'll find that scientists have put a lot of thought and energy into figuring out what makes sand stick together; NASA even sent an approximation of a sand castle into space for experiments. The goal was not to educate or help out kids at the beach, but because the same principles apply when you're looking at things like that landslide that ate Hwy. 101, or liquefaction during earthquakes. Relatively recent research, by a team at the Max Planck Institute for Dynamics and Self Organization in Göttingen, Germany, shows that sand sticks together when water forms capillary bridges between sand particles. While they used sand-sized spherical glass beads for the study, the irregular shape and size of sand grains also changes how the bridges form. Beaches with fine sand result in different castles from big grain sand, and it's likely also further complicated by myriad other factors, the composition of the sand itself, black sand versus white sand and so forth. The Friends of the Dunes ignore the science but offer some tips on making better sand sculptures, mostly relating to compaction. They advise digging a hole near the high tide mark to get "big, wet, soupy handfuls of sand" that are then plopped and jiggled ("do not pound") in layers that merge with the plop below to build height. Repeat until it looks cool. Then sculpt. Be whimsical and don't hesitate to incorporate beach ephemera (shells are good). Do your best and they may give you a prize. The Sand Sculpture Festival folks give out awards for: most imaginative, best youth sculpture (for sandy sculptors 12 and under), the golden shovel award for best business-sponsored team, the Friends of the Dunes staff pick, the people's choice, the most dedicated diggers, and the grand prize: best of show. Ultimately, knowing how and why sand sticks together won't help you win. Diligence and creativity are far more important. Bring along your fiddle or a guitar if you like. 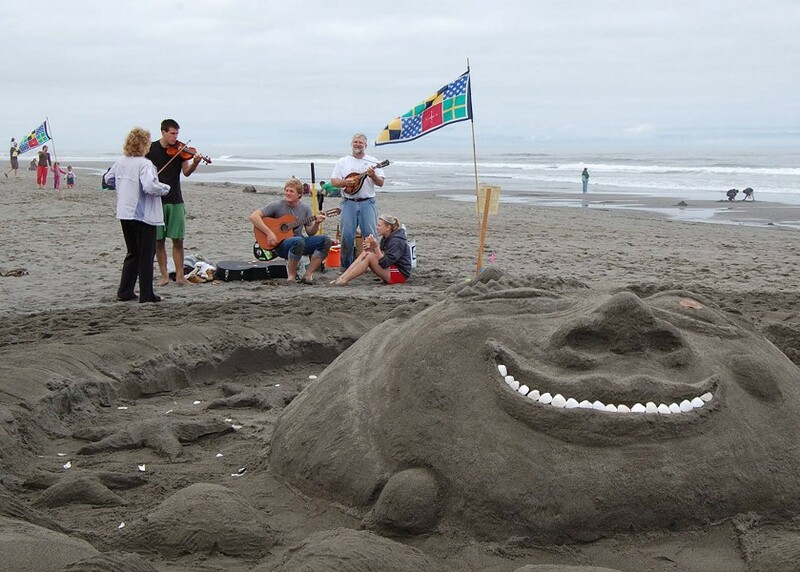 The Friends of the Dunes 16th annual Sand Sculpture Festival takes place on Saturday, June 25, at the Manila Dunes Recreation Area near Manila Community Center (1611 Peninsula Drive) with sculptors registering and working starting at 8 a.m. Final judging of the sand sculptures begins at 1 p.m. Winners are announced at 2. Organizers suggest that the best time for spectators is from noon to 2 p.m. All proceeds benefit Friends of the Dunes' Bay to Dunes School Education Program. For more information, contact Friends of the Dunes at 444-1397 or go to www.friendsofthedunes.org.